Individual or group based coaching in West Sussex and Hampshire. HoppCoaching is a tennis, squash and racketball coaching business. Richard Hopp is the Head Coach and is qualified to coach in all three disciplines, Angie Hopp is the Coaching Co-ordinator putting all the courses together. The game has changed a lot in the last 20 years and techniques have changed to compliment the advancing technology. Modern techniques can help you be more consistent in your play, more assertive in your shot making and more clinical in your finishing; and its flexible – there are literally 500 different ways to hit a forehand. I can help you modernise your game to get results. Fun based tennis coaching focusing on building solid basic technique for all the major shots through games, drills, match play and fun tournaments for Reception children and older. Starting on a smaller court with low compression balls to aid the learning process, mini tennis is a great way to get children started in tennis. Older children progress to full size courts and continue to develop technique and tactics with fun tournaments, drills and games. 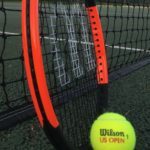 As a rough guide you should restring your tennis racquet as many times in a year as you usually play in a week – so if you play twice a week you should change your strings twice a year – but every six months as a minimum. Both squash and tennis strings lose their playability long before they break. You wont realise how bad the old ones were until you get some new ones! Played on a squash court with shorter racquets and a bouncier ball, racketball is a great fun game which falls between squash and tennis. The game is based on the tactics of squash without the intensity of the low bounce of a squash ball, keeping you fit without the harsh impact on your joints. From beginners through to Advanced players, lessons will improve your technique and see your game get better. With the ability to hit a better length, select the correct shot and move well around the court, you can take your game to the next level. Squash lessons take place at The Avenue Lawn Tennis, Squash and Fitness Club where I am the Club Coach. Got a problem that you can’t sort out? Got a weakness that your opponents keep exploiting? Some fault diagnosis may be just what you need to sort your game out and progress. With video analysis and instant feedback using Coaches Eye. ES&R Racketball Coach (April 2010), PTR Tennis Coach (June 2003), LTA Tennis Assistant (Sept 2002), England Squash Level III Advanced Coach (Sept 2001), England Squash Level II Club Coach (May 2000), Diploma in Sports Psychology (1999/2000). I am a full time professional tennis, squash and racketball coach based in Chichester, West Sussex. I coach squash and racketball at The Avenue Lawn Tennis & Squash Club in Havant. My tennis coaching is spread over several locations in West Sussex and Hampshire on private courts and village clubs including Oakwood School, Chichester College, Rogate Tennis Club, Milland Tennis Club and Graffham Tennis Club. My coaching style is relaxed and informal as well as informative and professional. I use my knowledge and empathy to understand every client’s needs and tailor each session accordingly. This enables me to help you improve your all round game technically and tactically or diagnose and correct any specific faults or problems that you present me with. I have very strong links with Game Set & Match in Chichester who offer an excellent range of tennis and squash equipment as well as excellent service and advice. I am also very proud to be sponsored by Wilson for both squash and tennis, and can highly recommend their excellent equipment for both disciplines, and Sunwise sunglasses – I use their Waterloo Chromafusion 2.0 reactable lenses for changeable light conditions on court. I have collected together a number of video clips from the web that show professional players demonstrate basic technique in both tennis and squash. Very good for studying movement, shot selection and technique. We run courses for ages five and up during the school holidays. See the course page for details of upcoming courses in the West Sussex and Hampshire area. “Thank you SO much for all the kiddies’ coaching this summer and ESPECIALLY for the coaching in the pouring rain yesterday! “Just wanted to add my thanks. I have thoroughly enjoyed the lessons and am amazed at your positivity even in the face of adversity. “Thanks once again. Skye and Josh really love the sessions. It’s good to see them making progress but more importantly to watch them grow in confidence whilst having such great fun. Interested in a course or individual coaching?